The free online image editor was the first on the internet to add glitter to images! 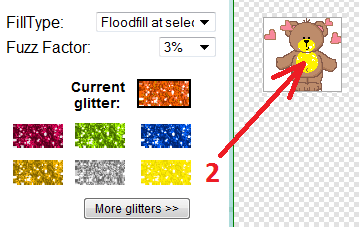 Here it is possible to create your own gif with glitter animation. You decide where you put the glitters and which color they should be. Click inside your image to add glitters. 1. First (off-course) upload a picture. 2. 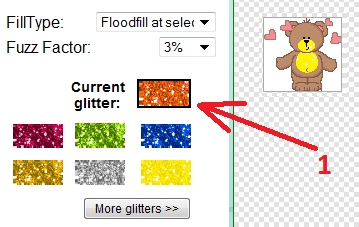 Go to the "Wizards" tab and click on the "Add Glitters" button. With certain images it is rather difficult to select the area which has to be glittered. you put the fuzz higher. (the hearts are not fully transparent). (the hearts are fully transparent now, but the bear also turned transparent). To solve that, we are going to make use of the "Floodfill at selected Color". To have a better control over that, you can use the 'fuzz' and 'fill' select boxes. (the hearts are fully transparent and the bear is still good). If you have made something with nice glitters, which you want to show off? Or if you have nice glitters laying around which you would like to be added? For any ideas or suggestion, you can always contact me.